Lately I have been on quite the sewing streak. Ever since I went to the Lizzy House workshop at Susan’s, and Paul bought me a new machine for our anniversary, I’ve been remembering that sewing is fun – not frustrating (an older, not quite “right” machine can really make you dislike sewing). I also was inspired by the fabrics that Lizzy has created and have been snatching them up as budgeting allows. But what do you make with such treasured fabrics? It’s kind of hard to decide, as it turns out – the more you like a fabric, the more you don’t want to mess up badly whatever you are making with it.. But, I’ve made two things so far that I am very pleased with (though I really want to buy more of the same fabric and make MORE things with it!!). 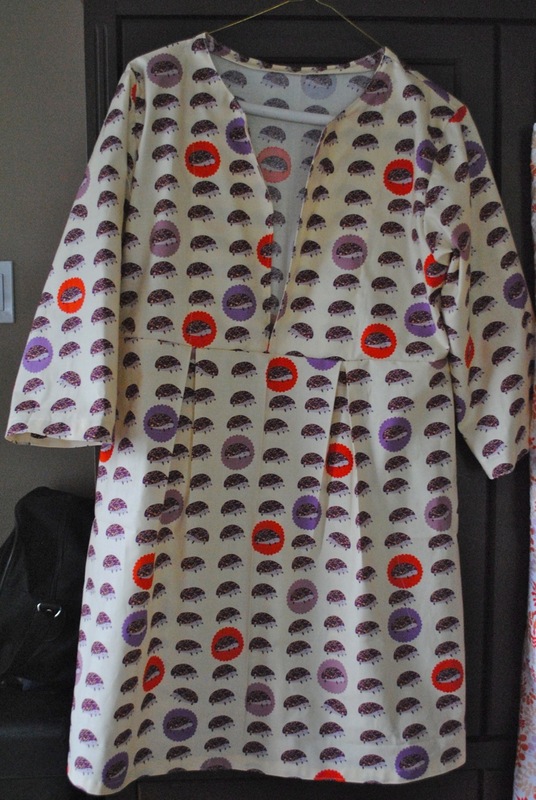 This is my new “Schoolhouse Tunic” by Sew Liberated (dress length) in Lizzy’s “Outfoxed”. I love how it fits and it’s very comfortable and flattering. 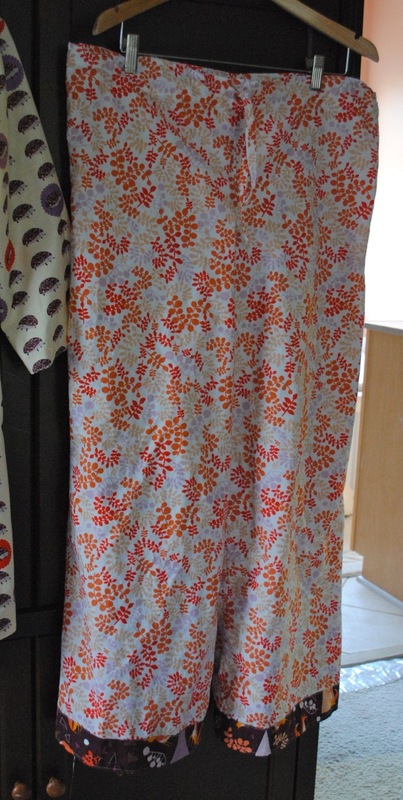 But I just love this fabric so much I want to make MORE dresses, tunics and skirts with it. I mean, just look at the little hedgehogs! I think this calls for a skirt as well, don’t you? These are my new Wide – Legged Lounge Pants from Amy Butler’s In Stitches. 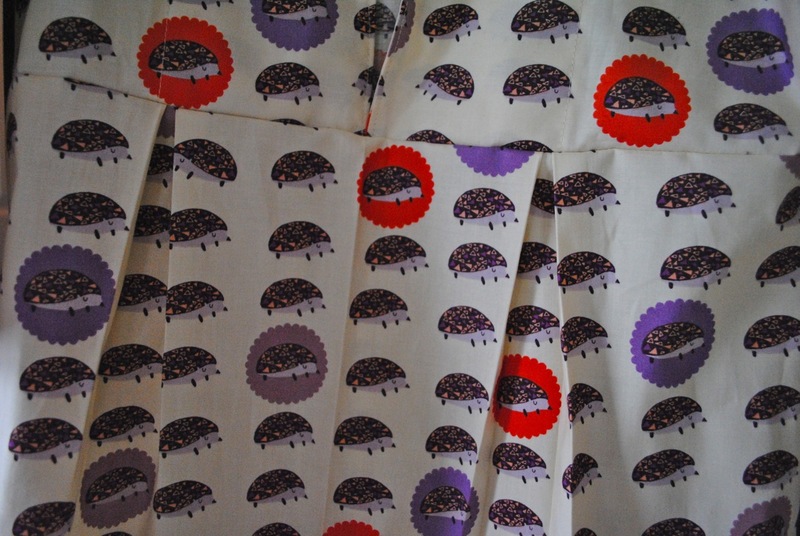 This fabric is also from Lizzy’s “Outfoxed” collection. I have been wearing these nearly non -stop around the house since finishing them. Right now I am working with another Lizzy Fabric from her new “Hello Pilgrim” collection – no sneak peeks today, but I am nearly finished with it so I’ll be showing it off soon enough. These are adorable, and look perfect for even the worst hot summer day that may be headed our way. You’ll have to model on a future post. Two thumbs up AND a gold star. Amy, you are amazing. I don’t know how you do as much as you do, and pull it all off so beautifully. Both of these garments look perfect for even the worst summer heat that may be headed our way. I hope you’ll model in a future post! Two thumbs up, and a gold star.